People are always asking me for quick, delicious, healthy meals that they can make on busy weeknights that the whole family will love. Although that seems like a tall order, I believe this recipe fits the bill. It’s one of my go-to meals because it’s actually deceptively simple to make yet looks elegant enough for company. And kids love it too- in fact, it’s a great way to get them to eat fish.Did you know that The American Heart Association has a dietary guideline recommendation that adults should eat at least two servings (3.5 oz each of cooked fish or ¾ cup flaked fish) of salmon or other omega-3 rich fish per week? How about that the new updated 2010 USDA dietary guidelines also recommend eating two servings (4 oz each) of seafood per week? Until now, the twice-a-week recommendation for seafood was limited to people diagnosed with heart disease; now it’s recommended for everyone. In addition to all of the health benefits provided by omega-3 fatty acids, salmon is also high in protein and has an abundance of vitamins and minerals including B-complex vitamins, selenium, phosphorus, and potassium. I especially enjoy using wild Alaskan seafood. On top of all of the amazing health benefits, wild Alaskan salmon is a sustainable fish, which means it can be enjoyed relatively guilt-free with regards to the environment. Alaska’s waters are also among the cleanest in the world. Recently, there have been many concerns about mercury and other contaminants in fish. The amount of contaminants depends on the type of fish and where it’s caught. Fish higher up in the food chain such as shark, swordfish, king mackerel and tilefish tend to have higher levels of mercury because they eat the smaller fish and therefore their levels build up. Industrial pollution can also produce mercury that contaminates water and for this reason every state issues advisories about the safe amount of locally caught fish that can be consumed. Salmon, however, is typically low in mercury. The updated USDA guidelines state that the benefits of consuming seafood far outweigh the risks, even for pregnant women. For most people, it’s unlikely mercury would cause any serious effects but it is still recommended by the Food and Drug Administration and Environmental Protection Agency that women who are pregnant or nursing and children under 12 should avoid high mercury fish. They can enjoy the heart healthy benefits of salmon and other low mercury fish but should limit their intake to 12 ounces/week and limit albacore tuna to 6 ounces/week. For those vegetarians out there, don’t worry- you can get omega-3s from supplements, but consult your doctor first as they can have adverse side effects at high doses. Also, certain vegetarian foods such as canola oil, flaxseed, walnuts, broccoli and soybeans contain high levels of alpha-linolenic acid (ALA), another omega-3 that is good for you but hasn’t yet been proven to have the same health benefits as EPA and DHA. The key to preparing perfect salmon is not overcooking it. I think the best way to cook it is to pan roast it, which is a technique that restaurants use to cook proteins. It involves searing the fish on both sides in a frying pan and then sticking the pan in the oven to finish cooking it. By searing it first, you get a nice, golden crust and it locks in all of the juices, keeping the salmon very moist. It only takes about 5 minutes in the oven- just enough time so that it’s barely cooked through because it will continue to cook a little more once you take it out of the oven. By using this technique, the salmon will be buttery and moist. 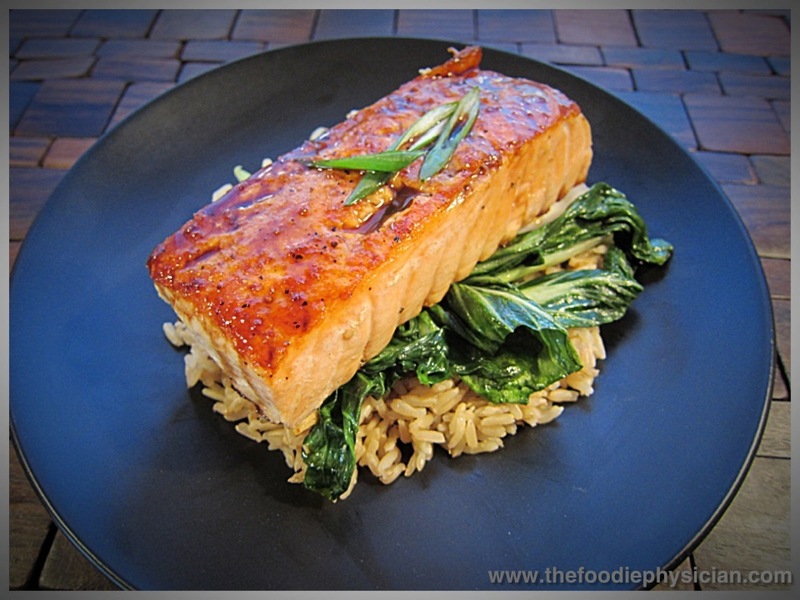 In the recipe below, I top the salmon with a ginger soy glaze that forms a lovely sweet and savory coating. For a well-rounded meal, I serve this dish with sautéed baby bok choy and brown rice- delish! Whisk the soy sauce, honey, mustard, ginger and Sriracha together in a bowl. Heat the oil in a large oven-safe saute pan over medium high heat. When the pan is hot, season the salmon fillets with salt and pepper and add them to the pan, presentation side down. Cook 2-3 minutes without moving, until a golden crust forms. Turn the fillets over and transfer the pan to the oven. Cook 5-6 minutes until salmon is just cooked through but still slightly pink in the middle. Carefully remove the pan from the oven and transfer the salmon to a platter. Pour off the drippings from the pan and heat the pan on the stove over medium high heat. Add the soy sauce mixture to the pan and cook 2-3 minutes until thickened. Pour the glaze over the salmon. Garnish with scallions if desired. Chattipakron N, et al. Cardiac mortality is associated with low levels of omega-3 and omega-6 fatty acids in the heart of cadavers with a history of coronary heart disease. Nutrition Research. 2009;29:696. What you need to know about mercury in fish and shellfish. U.S. Food and Drug Administration and Environmental Protection Agency. http://www.epa.gov/waterscience/fish/files/MethylmercuryBrochure.pdf. Accessed Oct. 7, 2010. That looks great! I love the information on omega-3. We eat a lot of seafood in our house. My husband buys whole fish and marinates and grills it, our son LOVES it! 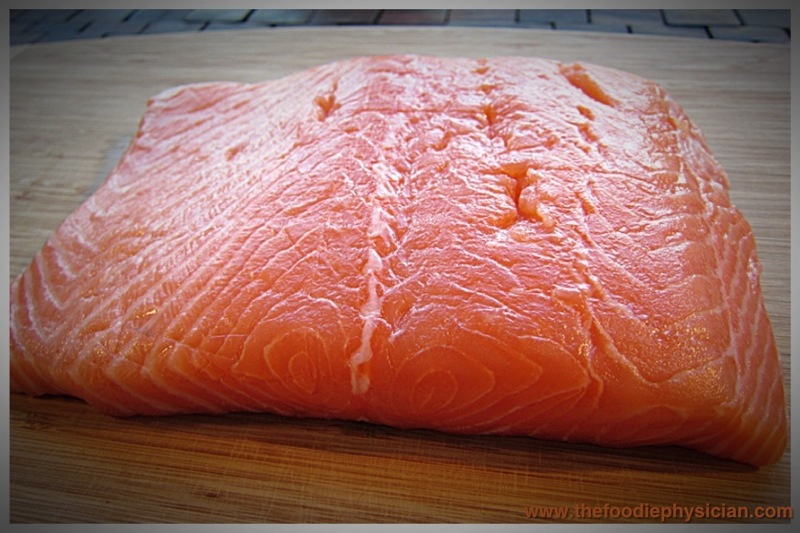 Must put this on my to-try list, I have never cooked salmon mostly because I didn't know how. Thanks for sharing another wonderful recipe Sonali. we love this simple and healthy salmon dish.Thanks for all the nutritional benefits that go along with the tasty dish.I will definitely reserve this one for a quick fix dinner. So glad you like the recipe! Yes, I love cooking salmon because it's so easy to make. If you try the recipe, let me know how it goes! Wonderful! I never know how to cook salmon and this does seem easy! Mmmm… Sounds good. 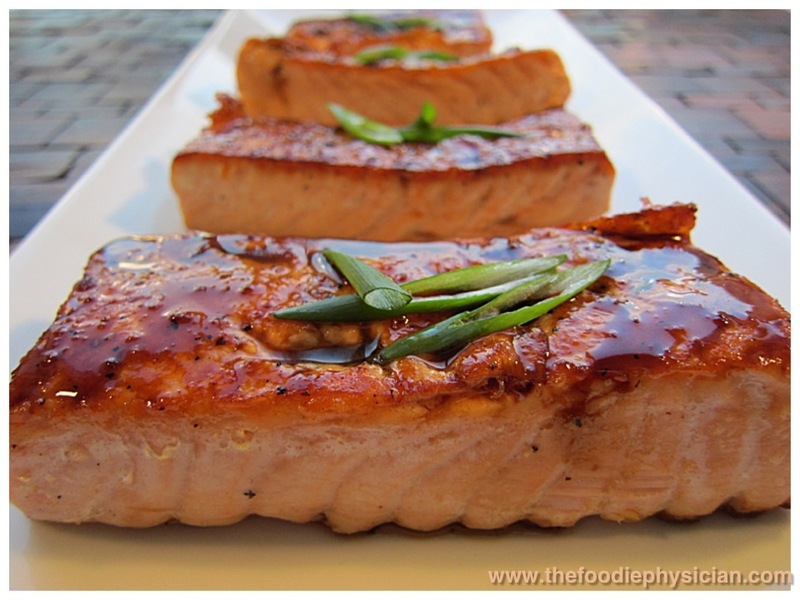 We have been baking our salmon with garlic, ginger and soy just kind of dumped onto it (I am making this tonight). Will definitely have to try this recipe next time. What do you think about using Tamari instead of soy sauce? I seem to like the flavor, but I am not sure what the real difference is. I so admire what you do & wanted to let you know! I've always grilled my salmon, seems easier but yours looks AMAZING! How do you juggle the 2? Thanks so much Eleanor! I was just checking out your site and I'm so impressed! It is hard to juggle the two, but I love what I do so it makes it a lot easier. Thanks for your comment "Anonymous." I think Tamari would be great in this recipe. I usually use low sodium soy sauce because I like to control the amount of salt I put in my dishes. Tamari is similar to soy sauce- it's also made from fermented soy beans but it's thicker and has a richer, more complex flavor. Because it's thicker, you probably wouldn't have to reduce the sauce for more than a minute or two. Let me know how it goes if you try the recipe! came to your blog and have been reading along your posts. I decided I will leave my first comment. This salmon looks fantastic!! My whole family loves salmon, kids included, they are always asking for it. I will have to try this preparation! Thanks, Aggie! We love salmon too. This recipe is really easy and it's kid-friendly too. I hope you like it! Wow this salmon looks amazing! Thanks for sharing it. I'm going to pin it! Thanks Allison! I just added you to my blogroll, I really love your site. I'm thinking of doing a Wordless Wednesday at some point. If I do, I'll definitely give you a shout-out! I just shared this on Amee's Savory Dish's Fit and Fabulous Fridays! I have done this quick, easy-to-cook recipe multiple times and each time it turns out better than the first time. I just shared this dish on Katherine Martinelli's Salmon blog hop.